You are at:Home»TILLAGE»Machinery»New 8 Metre Trailed Cultivator from Weaving Machinery. New 8 Metre Trailed Cultivator from Weaving Machinery. LAMMA 2016 will see the launch of Weaving’s Short Disc 8000T. To complement the existing and successful Short Disc range, Weaving Machinery have recognised the need for a higher output model to maximise efficiency with their new 8 Metre model. 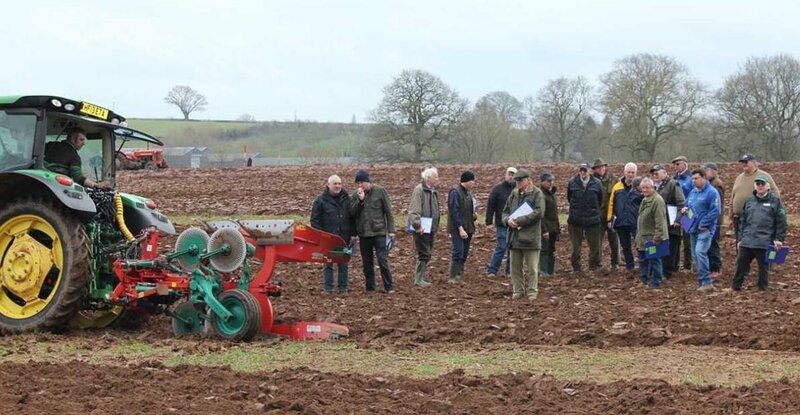 Currently in use across the UK this shallow cultivator is fast and economical to use, perfect for chitting weed-seeds and volunteers, producing a level and uniformed finish. Built for reliability and endurance, the Weaving Short Disc cultivators have a 12 month guarantee on non-wearing parts. The low maintenance requirement is a key feature with boron steel notched discs mounted on maintenance free fully sealed bearing hubs. The powder coating surface treatment inhibits corrosion and extends working life on all metal components. Standard equipment for the Short Disc 8000T includes 64 scalloped boron discs followed by a full width ‘V’ ring roller. Transport lights, hydraulic brakes and BKT flotation tyres coupled with a compact 3 Metre transport width make this machine fully road compatible. A modest power requirement of 250HP enables operators to match productivity against efficiency. High work rates are achievable whilst maintaining working depths between 1.2cm (1/2″) to 7.6cm (3″). The heavy duty, horizontally folding universal Tool Carrier allows operators to interchange implements to utilise the machine to its full capacity throughout the year. The Short Disc 8000T will be available from January 2016 priced at £28,600 ex VAT.